WB TET Syllabus 2019 Pdf (डब्ल्यूबी टेट पाठ्यक्रम पीडीएफ, पश्चिम बंगाल टेट परीक्षा पैटर्न डाउनलोड करें): Recently The West Bengal Board of Secondary Education has released a notification containing the details for Teacher Recruitment. Through the notification, the candidates were informed about the applications and the exam of the TET for all those candidates who were interested in pursuing teaching jobs. All the candidates possessing the interest in WB TET are informed that the apart from filling their applications they can start their preparation through the West Bengal TET Syllabus. Any important dates are not out yet however the candidates are also provided the WB TET Exam Pattern in this article. The West Bengal TET organizes the teacher eligibility test every year to recruit teachers for its upcoming sessions. 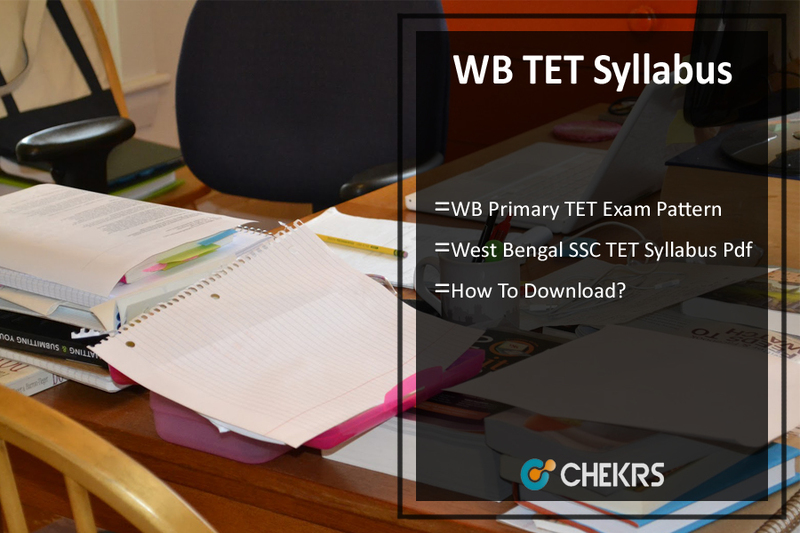 The candidates who have already filled their applications or will be filling it are informed that the WB TET Syllabus 2019 Pdf is being provided to them. The candidates can initiate their preparation right from now to excel in the exam. The WB TET Primary Syllabus with all the major topics is provided in the table below. Reading Unseen: Drama/Poem/Passage (for the language-I it will be I and 2 in language II): with questions on comprehension, inference, grammar and verbal ability. The candidates who are searching the official website for WB Primary TET Exam Syllabus 2019 Download can initiate it only once the exam dates are announced. The candidates can follow below-given steps to download. Search on the home page for WB TET Syllabus. Open the link of Click here available next to it. In order to attempt the WB TET Exam paper well, the candidates will require a good knowledge of the West Bengal Primary TET Exam Pattern 2019. The question paper for the primary teachers will comprise the subjects such as Child development and pedagogy, the language I and II, mathematics and environmental studies. Here in the table below we have provided all candidates the exam pattern of for the applicants. The candidates are informed that though there is no negative marking in the exam but the number of candidates appearing in the exam makes it a tough competition. The candidates are notified that syllabus for the TET will be released by the officials only once the exam dates will be announced and also the link to download it will be active for a short period of time. All those candidates who want a full proof preparation for the exam are advised to follow the article and WB Primary TET Syllabus 2019 provided by us. For more exam preparation help of recruitment keep following jobs.chekrs.com. If you have any questions, reach out to us by commenting in the section below.